The castle of Neuschwanstein was built by the Bavarian King Ludwig II as a homage to Richard Wagner and his operas. Each of the castle’s main and numerous chambers is decorated considering one of the romantic composer’s mythological operas. 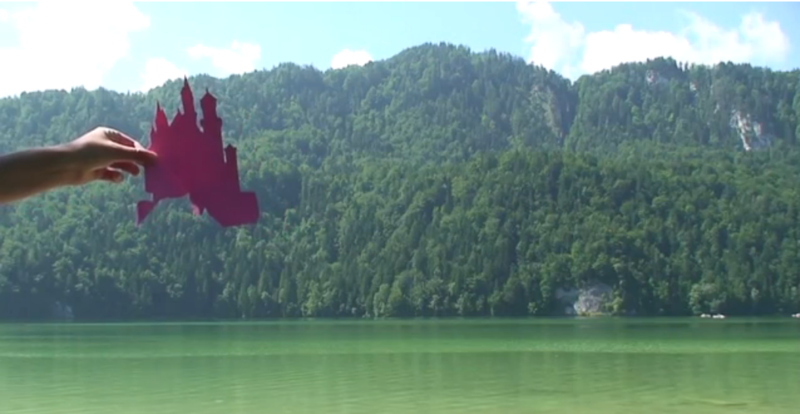 The video Neuschwanstein starts with an impression of the landscape, the Bavarian lakes, the mountains and the forest surrounding the edifice. Back and forth the film is then edited between location and certain structural elements of the building. By no means does the spectator encounter the entire image of the citadel, once again deconstruction challenges the imagination to piece the remaining parts of the structure together. Supported by a collage of Wagnerian music, original site sound and the echo of the landscape, Neuschwanstein doesn’t forget to remind us of its relationship to Disneyworld, nor does it fail to give us a witty interpretation of the epic German “Heimatfilm”. Catalina Niculescu was born 1978 in Bucharest, Romania, and studied at the Academy of Art & Design in Offenbach, Germany and at the Slade School of Art, University College London. Currently she lives and works in London. The artist made work in Berlin, London, Marseille, where she had solo exhibitions in galleries. Her films were screened at Milton Keynes Gallery and the BFI. In 2010 Niculescu travelled to China and held a residency at Triangle France, in 2011 her work led to a journey through Romania, in 2012 she held a residency at Raid Projects, Los Angeles. Catalina Niculescu’s practice exists in architectural space, between performance and documentational observation, between the live and the mediated. Systematic responses to the places the artist encounters result in a series of visual interferences with architecture and urban structures, recorded and rhythmically edited to create evocative, transferable events in film, video and photography. Imagery to silently reference painting and simultaneously to create a volatile subjectivity through a linear composition wherein light, shadow and darkness in addition to long shots of landscape and nature recur as equilibrium and correspondence to a manmade environment. While observing nature and light is per definition romantic, Modernism is per definition functional. Looking at their characteristics, both movements absorb several mutual concerns: the human body, nature, the vernacular and picturesque as well as a fascination for the exotic. In her work Niculescu often alludes to these similarities and casts their common interests through formal framing thus blurring the geometric organization of architecture and the constantly changing and unpredictable natural environment to reveal a peculiar synergetic relationship.